I recently had the chance to test out the full version of the 2019 edition of Rocket Spanish. At the time of this writing, it’s been a popular name in online language learning for 15 years (they’re now celebrating this milestone). I admit that I didn’t have the best expectations when I first heard about it (see below where I explain why) but Rocket Spanish has turned out to be one of the most comprehensive online audio courses that I’ve come across. Rocket Languages does not use a grammar-heavy method of teaching but rather demonstrates language in context using natural dialogues. It’s not a literacy-based program like many others. Rocket Spanish is one in a series of language editions. 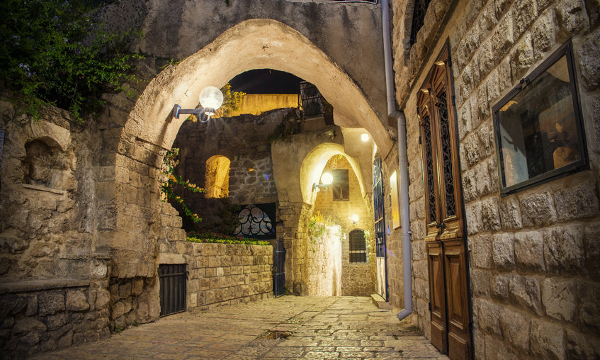 The company also offers: Korean, Portuguese, Japanese, Arabic (Egyptian), French, Italian, Hindi, German, Chinese (Mandarin), Sign Language (American) and English (for Spanish speakers). 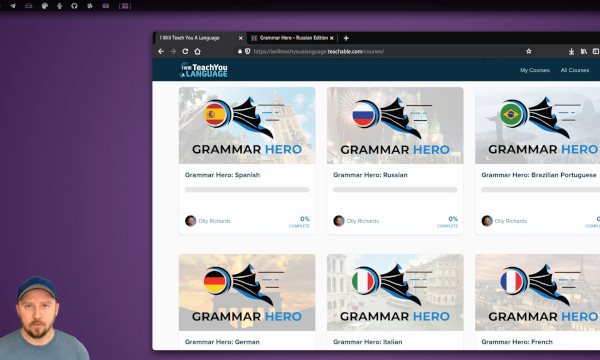 Rocket offers three different options for Spanish: Premium (67 lessons), Combo (122 lessons) and Works (185 lessons). Read on for my comprehensive review of The Works package for Rocket Spanish. NOTE: I’ve also included a VIDEO review at the bottom. First off – this is a massive selling point for me. You can download all MP3 and PDF content from the Rocket Spanish levels to be studied offline. You’re not locked into a program or restricted by online access. With some competitors, you have to use their program or have an active, online subscription to use the material. This is (in my opinion) a scam since you don’t have unlimited access to what you’ve paid for. Rocket Spanish is still one of the only resources that allows you actual ownership of everything you bought. You can then put the content on a mobile listening device or print it out. Rocket Spanish in my opinion beats its competitors on comprehensiveness. In other words, there’s tonnes of lesson content that’ll keep you busy for a long time. Household names like Rosetta Stone and Pimsleur by comparison just don’t offer nearly as much lesson content. Rocket Spanish is a serious trove that covers a wide variety of topics from the absolute beginner level through to advanced on just about every relevant Spanish-related topic. The audio’s recorded as it’s used in real life by native Spanish speakers. In Rocket Spanish like the other editions, you have two sections: ‘Language and Culture’ and ‘Interactive Audio’. 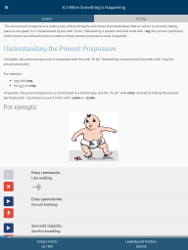 The primary course content can be found in the Interactive Audio section but the Language and Culture part is for grammar and detailed information on Spanish culture. One area where the Rocket Spanish audio content differs the most from competitors is in its use of humor and interesting dialogue. It presents lessons in a natural and fun way, where the lesson hosts actually engage with lesson material. Listening to Rocket Spanish lessons is enjoyable. This refreshing style coupled with immensely comprehensive content make Rocket Spanish a serious contender as an audio course. I love the Rocket Spanish mobile app interface. 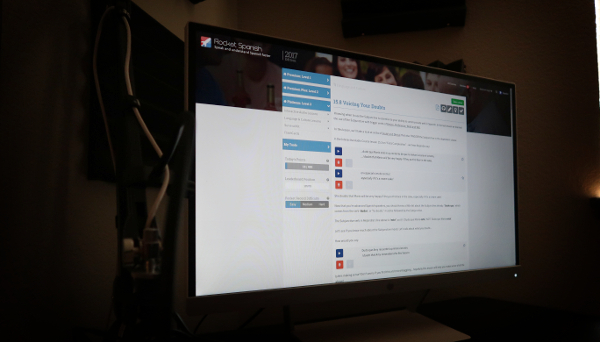 It’s sleek and clutter-free, works perfectly and allows me to access the exact same course content wherever I am. The mobile app for iOS and Android is incredibly simple and easy to use. From what I can see, all features including the voice recognition element work just as they do on the desktop version. If you commute a lot then you’ll appreciate having access to this (free when you buy the course). Rocket Spanish has an inbuilt flashcard feature for reviewing vocabulary. Review vocabulary from any lesson. Create your own vocabulary flashcard deck. There’s some great flexibility here in terms of what you can review using the inbuilt app. But additionally, Rocket Spanish allows you the ability to export to .CSV. This means that you can export spreadsheet lists of any and all vocab with translations and import them into your favorite flashcard apps (e.g. 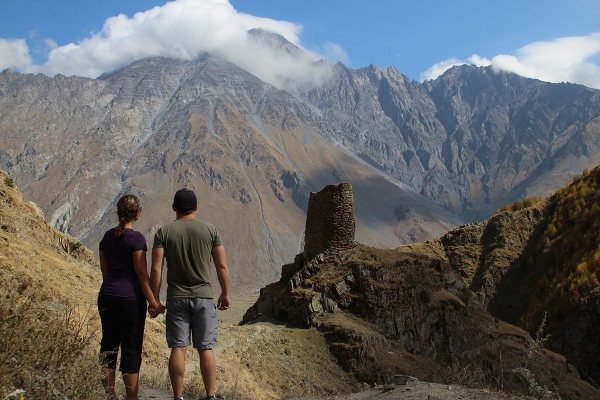 AnkiSRS) or to create your own learning material. The “My Vocab” tool serves another even higher purpose: it’s a powerful search tool for finding any word or expression in the entire course. If you’re ever looking for examples of a word in context, this tool is excellent. Like some of its competitor products, Rocket Spanish has some great gamified, extrinsic motivators inbuilt. 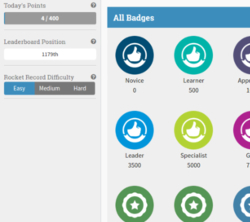 You can compete with other learners by earning points which enable you to climb up in rank (similar to Duolingo) from “Novice” all the way to “Black Star Hero”. There are 38 levels in total. This encourages unbroken study streaks and competitive learning. Not a revolutionary feature by any means but a great and fun motivator to keep you on track. 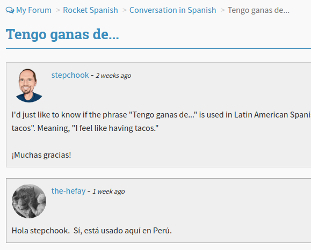 Rocket Spanish includes a community/forum section. The forum’s very active (lots of other users) who respond to help requests from each other. There also seem to be Spanish teachers in there who answer questions. This is a good feature for clarifying issues from the course content that may not be clear or to ask for help outside of the course curriculum. Now for the brutal criticism. While the content, comprehensiveness and structure of Rocket Spanish are tremendously good, there are still some valid concerns worth raising. Full disclosure: I use affiliate links on this site which means that if I review or recommend a product (including Rocket Spanish) and you buy it, a percentage of that sale goes to me. It doesn’t change or affect the price for the person buying it but that percentage helps me continue to run this site as I have for the past 6 years helping language learners all over the world. Unfortunately, there are a lot of abusive spammers out there who take advantage of this and produce bogus reviews (all over YouTube especially!) to deceive consumers. The problem with Rocket is that they have no control over this nonsense. You get thousands of spammers doing this and it actually damages the reputation of their company severely (in fact, I avoided the company for years because the spam made me suspicious of their courses). But what I can assure you of is that Rocket Spanish is legit and a high quality course despite the behavior of so many spammers. While the interface is sleek and attractive, it’s not ideal for visual learners. There’s a lot to be said for the Rocket Spanish interface which is distraction-free and loaded with audio content but it has occurred to me that the minimal use of photos and imagery might be a turn off for some. For example its competitor, Rosetta Stone, is full of imagery accompanied by audio and text. Rocket Spanish is primarily audio and text only. Admittedly, Rocket Spanish is an audio course. But some competitors (e.g. SpanishPod101) manage to include at least some video lesson elements which are helpful to visual learners. For some people, seeing a conversation between two people is a lot more effective than just listening. The audio content that they do have is outstanding but I’m hopeful that a video component will be added in the near future. There are some great and timeless products on the market for learning Spanish. In fact, it’s a drowned market full of competitors so it can be difficult to weed out the bad ones and find quality learning material. Rocket Spanish is a worthwhile investment and viable competitor to other big name Spanish courses. It’s moderately priced but by comparison to competitors, it’s quite inexpensive (especially if you buy a single level). While it does have some room to improve in certain areas, overall it’s a very comprehensive course that you’ll get years of use out of. If you’ve used it, share your thoughts on Rocket Spanish below.